**Note: The game I played of Millennium Blades was in no way a complete experience, as I only have Set Rotation and a few mini-expansions in my collection so far. No base game was used – but, honestly, the game was able to be played in a complete enough manner to really get a taste for what it offers. I was able to sub in some tokens for the bundles of money and the sell markers and it worked effectively enough to get a taste of the game. There happen to be enough cards in the box to make a full market deck, although I suspect there are a LOT more Core Set cards in the base game that add a lot more accessories. Magic: The Gathering was one of my first entries into modern board gaming. I had a regular group of guys in high school that I would get together with and we’d spend our weekends playing games of Magic, sessions of Dungeons & Dragons, and dump hours into games on the Playstation 2. I loved the thrill of opening packs and seeing what new powerful cards I could build decks around, I loved building new decks to test out against my group, and I loved trying to take under-valued cards and seeing if I could find combinations to make them work. But eventually high school ended, we all went our separate ways, and Magic: The Gathering left my life. Last year I found myself immersed in Star Wars: Destiny, and it instantly rekindled both the love and hate I have for these styles of games. Love because there is a thrill in opening packs and finding a great new card to build around and to spend time dreaming up possibilities for card/deck pairings. Hate because it becomes both a time and money sink. Eventually the release cycle’s aggressiveness scared me away from the game and I moved on from Star Wars: Destiny. Early in 2018 I fell into that same dance with the Final Fantasy Trading Card Game. It was a great game, one I still really enjoy playing, but I found I just can’t justify trying to build a collection to be competitive – and the need for real opponents in order to test decks and get better made my skill progression curve quite glacial. It was hard to play more than once or twice a month, and a CCG really needs at least weekly gaming sessions to test and improve decks, and the ability to buy the latest and greatest sets of cards to keep up with what other players will be playing. Which is why I absolutely am convinced I am going to fall hard for Millennium Blades because it eliminates virtually everything I hate about the CCG scene while embracing the best aspects of that hobby. The buy-in for everything in this game so far is quite reasonable, even at full MSRP from the publisher ($212 for the base game, Set Rotation, all the mini-expansions, and a playmat), when compared to what I heard of people spending for a single cycle of cards in Star Wars: Destiny ($400) – and there has been a cycle out about every 3-4 months since that. There’s a new expansion planned for Kickstarter in early 2019, and that’s still likely to make this cheaper than a single buy-in for one complete cycle of any CCG out there apart from maybe Dicemasters. To play solo, you really only need just over half of that ($80 base game + $40 Set Rotation expansion) – and you’ll end up with such an incredible amount of card variety that it will make your head spin just thinking about it. But the buy-in alone isn’t the real reason to be a fan of Millennium Blades after a single play as a solo exercise. Set Rotation adds in four bosses to face, each with their own unique deck containing a deck box, 4 accessories, and 8 cards. They will use 2 of those accessories (randomly chosen) and you’ll slowly get to know what those are and can somewhat plan around their deck’s strategy. You can freely look at their 8 cards, but 2 of them won’t be played and you’ll never know what order they will come out – so you can’t completely plan for that, either. Yet had I looked just a little at the boss’s synergies during my 20 minutes of building, I would have seen that he was almost guaranteed to flip each and every card I would get into play. My initial deck plan went right out the window within 2 cards, and I was left scrambling to make lemonade from the cards I didn’t sell or Fusion during the deckbuilding phase. But I’m getting ahead of myself, because one of the real stars here is that deckbuilding phase! In a non-solo game you’ll do that full phase 3 times, but in the solo game you get just one shot at building that deck (which is broken into two 7-minute phases and a 6-minute phase). This is where you can buy cards (you start with $30, and new cards cost from $3 to $6), sell cards (you can sell at most 4 cards, which are worth from $1 to $9 that I saw, with the average being $4-6) so you can buy around 8-16 cards to add to your starter deck and the other 15 cards you get over the course of the building phases. From all of that you need to figure out what 6 cards you are likely wanting to play, plus a deck box to use and up to 2 accessories to bring, for your match against that boss. The catch is that cards are blind buys. You know the set they belong to and how much they cost, but you have no idea what cards are underneath. Which is where the longer meta comes in through learning the cards in the sets and where combinations can come from in order to make smarter decisions – which will never come to you in the first play. It is generally a safe bet to buy cards in the same set, as there is often some overarching synergy you can find, but you can also trade 5, 7, or 9 cards of the same “rarity” for a special, powerful promo card that can bring your whole deck together or just provide something powerful to hold back for an emergency. If this all sounds like a lot – it is. Yet that is what delights me about the game. There is a massive card pool (the base game alone apparently has over 700 cards) of which you’ll use a hefty chunk every time you set up the market. The thrill of the blind buys – and seeing how you can or cannot make that card work with what you’re aiming for – is something close to mimicing that blind buy of packs in a real CCG. The limitation on how much you can purchase, how much time you have to buy and sell, and to piece a deck together is what makes this a crisp package. From setup to teardown (if you maintain the market after the game ends) can be done in under an hour solitaire, and there are ways to string together a gauntlet of boss battles (and a mini expansion that expands those bosses) which will give strong legs to this game. It scratched every itch I hoped for – and I’ve spent the past 12 hours (apart from when sleeping) constantly thinking back to the game, the clever cards, the decisions I could have made differently, and how to best the boss the next time I face him. The experience has stuck with me ever since the final card was played and the scores tallied, and that is what I want out of a game like this. I want to be theorycrafting card combinations and exploring strategies, finding out how to best make each starter deck work efficiently and analyzing the various sets of cards that can come out. That’s something you don’t get in modern board games very often, but is very much a part of the CCG scene. And so if I can get that CCG experience without breaking the bank account, that is an all-around win. This might be the best game in the Level 99 Games catalog. It has a good chance of becoming my favorite game in their lineup. It won’t appeal to every gamer, and can’t possibly be recommended for every gaming group or even every solo gamer. But for those who are seeking a blend of modern with the format of a CCG – and who want their bank account to remain in tact while doing so – this is a game that I think will have a strong appeal, and one I can’t wait to dive back into in order to see if these powerful first impressions hold up after a dozen plays. Thank you for checking review #80 by Cardboard Clash. My aim is to focus on reviewing board games and how they play for two people and, on occasion, how they play for one person. Because my wife is my primary gaming partner, a lot of consideration goes into finding those games that play well with 2 players, and we typically prefer to find those games that do not require a variant (official or otherwise) in order to play it with just the two of us. ***Note: A review copy of the game was provided for what had been planned as a deckbuilding month. With the medical time spent on my daughter since September, than plan went by the wayside. Shadowrift is a board game designed by Jeremy Anderson that was published in 2012 by Game Night Productions and later rereleased with a 2nd Edition by Game Salute (this review is based on the 2nd Edition). The box states it plays 1-6 players in 45-120 minutes and has a BGG weight rating of 2.69. You, the heroes, must band together to drive them back. To do this, you will need powerful spells, skills, attacks and loot. When the game begins, you are a basic hero; you can explore and fight. Luckily for you, Shadowrift is a deck-building game! You can buy new cards to add to your deck, cards that will define you as an adventurer and complement the strengths of your fellow heroes. Unlike other deck-builders, there is constant interaction with your fellow players as you figure out who will gain which benefit from the limited supply of townsfolk, offer their coin to help construct walls, and seek healing from anyone who’s learned such magic. Shadowrift also features monsters that don’t merely sit waiting to be slain; if you leave them alone, they will rip Haven Town asunder. They’ll kill people, break walls, and kick your heroes in the face. Combat with them is intuitive (though frequently painful). For defeating a monster, heroes gain Heroism, a simple, consistent boost to their power that makes them better at anything they undertake. Since the monsters won’t stop coming until the last Shadowrift is sealed or the town has been built into a mighty fortress, you’ll need every boost you can take. For one player: Assuming one-handed play for solo, you have 8 Heroism rather than 1 per player, and during the Monsters Gain Power round they gain 3 rather than 1 per player. Additionally, the player gets two full turns after each Monster turn; however, the Town and Traveller lineups do change after each player turn. 2 Shadowrifts are added to the deck rather than 1 per player as well. For two players: Monsters gain 2 power per round, 2 Shadowrifts are added to the monster deck, and 10 Heroism cards are used. Really, these are just based on # of players and in no way changes the rules of the game. This game was a novel approach to the deckbuilding genre long before it rose to extreme popularity. To put it into perspective, Dominion came out in 2008. This came out in 2012. It came out after Ascension (2010), Arctic Scavengers (2009), Eminent Domain (2011) and Thunderstone (2009), the same year as Legendary (2012), Fantastiqa (2012) and DC Comics Deck Building Game (2012), and before both Star Realms (2014) and Aeon’s End (2016). Compare it to the ones out before, and around the same time, and this one stands pretty tall in its uniqueness. Maybe only Fantastiqa can really compete in that sense. Shadowrift still provides a very unique deckbuilding game that can stand alongside those other names because there isn’t one of them that does the same thing as Shadowrift. At first this game appears to be about fighting off hordes of monsters. Then it appears to be a town defense game. Yet it is both of those things while at the same time being neither of those things. Some games, when they try to be clever and incorporate too much, lose some polish in the final product. And maybe the 1st edition had some of that. But the 2nd edition of Shadowrift juggles the deckbuilding genre, multiple types of currency, hordes of monsters, and town defense in a way that I’ve never seen before. For an older game (relatively speaking), it is surprising to get such a breath of fresh air from this game’s approach. There are a lot of combinations in the box. Yes, astronomical computations could be made. But essentially you get six monster factions to fight against using a set of 8 market cards of your choosing. Most people will probably play a monster faction a handful of times, realistically, before wanting to either move on or expand the game. But even there you have roughly 20-25 plays just in the base game alone. The nice thing with these market and monster-driven games is that they are easy enough to integrate expansions into without needing to really change any core rules. There are three currencies in the game, and you start with just the most basic of them in your deck. You can spend 2 to buy coins, which are one-time use and can be spent in a variety of ways. The most difficult to obtain would be the magic symbols, which often appear on spells but then you get the decision, when it is in your hand, on whether to use it for the spell or for the magic symbol. This factors into what I’ll be alluding to shortly regarding the absence of deck thinning, making it essential to decide early how to fill your deck with cards. Nothing is more frustrating than always drawing the Seal you need to clear a Shadowrift and never having a Magic symbol to use its ability. Another neat deckbuilding decision comes from the Epic symbols on some market cards. On a player round (players take turns simultaneously, meaning the order in which you play cards as a team can matter and so communicating as a team is essential to be as effective as possible) you cannot play more Epic cards than there are players. So in a solo game (one handed, of course) you can play only one. Draw a hand of 3 of them? Too bad (unless a specific villager is in the Town to let you play an extra one). These are often the most powerful effects, usually based around combat in some fashion. You definitely want them in your deck. But you don’t want JUST them in your deck. They add interesting decisions along the way as you play the game, something you’re going to hear me say more and more about Shadowrift. The Town and the Travelers are what really gives this game flavor and makes it shine when compared to some of the other staples in the genre. At the start you have 10 villagers in the Town deck, each of which have some sort of effect when in the Town or an Aid ability the players can use (once) on their turn. There is also a slightly thicker Traveler deck, which will flip over two cards every round. Some of the cards are people you can buy into the town deck, usually costing Coins and/or Prowess (the generic resource). However, there are some red Infiltrator cards that, when flipped into the face-up Traveler spots, immediately go into the Town discard pile. Which means they get shuffled in the next time you need to shuffle the Town cards to refill those five cards (which happens every round). If you ever have 5 corpses and/or Infiltrator cards into the Town display at the start of the Heroes’ turn, you lose. This deck refills before the monsters go, who then go before the Heroes. Which means even getting out 3 of those red cards can signal danger if there are some monsters about to act and Kill some villagers. Lucky for you, most Infiltators have a cost you can pay to put them back on the bottom of the Traveler deck (which is also where dead townspeople go). It is a simple pair of mechanisms at work here, but they add such intriguing decisions: do you spend resources to buy cards for your deck, or do you add travelers to the Town, or do you try and remove those Infiltrators? We come now to the elephant in the room that I can already hear people begrudging this game over: there is no deck thinning mechanism. Yep, you read that right. There are ways to remove wounds and afflictions, both cards that enter your deck via monsters, but once you buy a card it is in there forever. Same with your starting ten cards. Bold move? Perhaps, and something no deckbuilder today would dream of doing. Yet it is slightly balanced from the Heroism cards you get from killing monsters, which not only counts as any 1 of the 3 resources, but also lets you draw a card immediately when you draw the card into your hand. There’s also some Might cards that are the cheap currency which allow you to draw a card, but remove themselves when used for anything but a keep-in-play trigger on an action card. Rather than begrude the game for what it lacks, this should be embraced as an interesting puzzle each round. Every card you buy makes it less likely you’ll draw every card in that deck, meaning it needs to carry its weight. Is that generic 1 melee damage worth adding to your deck, or should you just buy a coin instead for a future turn? This is one of the things that makes this game so darn interesting to puzzle out right now, because most deckbuilders you can take thinning for granted and race to remove those starter cards. Getting the rifts closed is important in the game. With 1 or 2 players, you’re looking for two rifts that are added to a 20 card deck – one in the top 10 and one in the bottom 10. Another element of randomness, you see. However, you have a card in your starting deck that can place the top Monster card from the deck onto the bottom of that deck – and you can always see what the next card is coming off the deck (it is face-up) so you won’t accidentally throw that Shadowrift to the bottom. There are a few other cards that can help cycle those cards, too, letting you dig a little faster. I’ve seen both Shadowrifts only once, but I’m not a great player yet. It stinks that your rifts could be cards 1 and 22 off the deck, but it is great that you can help speed it along. My first plays of the game felt like I was losing to the luck of random draw. And yes, that will always be a possibility. If you get a strong reaction toward knowing your game could end due to a bad draw, this one might leave a sour taste for you. However, the redeeming quality in here is that you can do things to give that Town deck better odds by buying new Travelers, eliminating Infiltrators as soon as you can, or preventing the monsters from Killing townsfolk. It is a lot to juggle, especially solo. I’ve heard the game is far easier at higher player counts, simply because you have more hands on deck to specialize and deal with the unique areas of the game. When playing solo, those resources are scarce enough that it makes every decision matter. And even when you are playing well, it still could end with 4 of the 5 cards flipping out red and the one monster that just got added happens to Kill the exact symbol that isn’t red. It can happen even if you only have 4 red cards in that deck. Early in the game, this doesn’t sting so bad. But if it happens when you’re nearing the end of a grueling, long fight…that could become table-flipping territory for some players. When I looked at this game, my immediate thought was Aeon’s End plus Marvel Legendary. While it has some thematic and mechanical similarities to both, this game is nothing like either of those games, but is more like Legendary than it is like Aeon’s End. What if I told you this game originally came out before either of those games? Some older games do not age well. Others just take longer to gain popularity and hit their prime. I’m convinced that Shadowrift still has not “arrived” yet in terms of making waves, but it definitely should not be overlooked. This game provides a far more thematic approach to defending the town than you had in Aeon’s End. This game gives a greater challenge, and requires far less setup/teardown time than Marvel Legendary. And boy, is this game a challenge. Not necessarily because of any heightened difficulty built into the game, but rather because you are trying to balance several things effectively. The obvious threat comes from the monster deck and the interactions brought about by the monsters traveling across the play area. Fighting them is essential, yet clogs the deck through wounds (usually) gained from battle. But if you overlook the travellers coming to town, you could find yourself filled with infiltrators and corpses and bring a premature end to your efforts, no matter how successful you are at fighting back the monstrous horde. My first loss in the game was bitter. Not only was I doing a poor job at killing dragons, I was poorly managing the cards clogging up my hand and completely ignored the Town deck. It got overrun with bad cards, which meant sooner or later I’d see 5 dealt out to give me the loss. I felt like the game was impossibly hard and lacked good decisions. I tried it again against the same match, with the same market, and had much of the same results. Turns out the recommended starting game wasn’t a great starting one for winning solo. But as I kept returning to the game and playing further, I started to get better at tracking my deck of cards and keeping an eye toward the Town deck. Have I perfected that balance? Hardly. In fact, I’d argue that I am quite a ways away from hitting that efficient stride after 6 plays of the game. Which is something I really like about this game, because it makes you think in ways that other games in this genre don’t. Not only are there three resource types in the game, there are also two methods of attack. Resources can be spent to improve your deck, or to improve the Town deck, and sometimes to help cycle the monster deck. The game is more than just get buying power early to get attack power and then stop buying cards while you smack enemies around. The game is more than culling cards ruthlessly until you can play your entire hand for super turns every round. And that is a breath of fresh air in a genre that, at times, can feel repetitive and stale. There’s a reason why Mystic Vale is my favorite deckbuilder: it takes the genre and does something fresh with it. Aeon’s End did the same thing with the breaches and not shuffling. But this game takes the deckbuilder concept and really makes you have to consider, every single turn, how your decisions will impact your long-term goals. As a solo/co-op gamer, I hate high win percentages (looking at you, Sentinels of the Multiverse). My favorite game is sitting firmly at a 31% win rate after over a hundred plays, and that feels perfect. The wins in Shadowrift are coming for me eventually. And until then, I’ll enjoy having this hit the table as part of a rotation of games I definitely want to make sure I play every month. 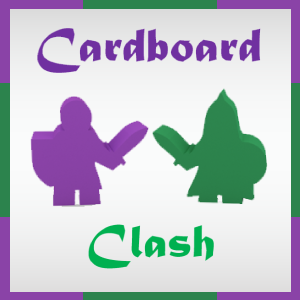 Thank you for checking review #79 by Cardboard Clash. My aim is to focus on reviewing board games and how they play for two people and, on occasion, how they play for one person. Because my wife is my primary gaming partner, a lot of consideration goes into finding those games that play well with 2 players, and we typically prefer to find those games that do not require a variant (official or otherwise) in order to play it with just the two of us. Fantastiqa: Rival Realms is a board game designed by Alf Seegert that was published in 2018 by Eagle-Gryphon Games. The box states it plays 1-2 players in 20-30 minutes and has a BGG weight rating of 2.50. None, as this is a 2-player only game, with a built-in solo mode! The simplicity in concept cannot be understated here. You are trying to make three rows of 6 cards, going in ascending order. The deck contains 50 cards, numbered 1-50. In a nutshell, this is what you are fighting to accomplish. However, like any great game, there is far more to it than meets the eye. A game with just this exercise in ordering could be fun, but would lack staying power. This game, however, adds two major wrinkles (covered in the next two points). Those cards used to explore go into your opponent’s discard pile, which they can draw from (any card in there, not just the top one) at the end of their turn rather than the top of the deck. Which does two things, potentially: allows them to draw the numbers they might need to fill in a row, or draw the terrain they need to explore. The decision of what cards to use for your own exploring can be a critical choice to make, as you don’t want to gift your opponent with the perfect cards they need. Tying further into all of this comes the scoring at the end of the game, which is done in a remarkably clever way. There are six quest cards (more on those below) that reward the player who gains specific achievements first and awards 4-7 points, players lose points for every slot they didn’t fill with a card, players gain 2 points for cards in the same row that is adjacent to the same terrain, and 3 points for the same concept but from row to row, connected by valleys. So just rushing out cards to fill your board won’t net you a ton of points, you need to balance the exploring as well. But then you need to consider the placement as well, as matching terrain cards are 5 numbers apart but give extra points during scoring. But then they also require more cards of that terrain type to explore them, meaning you need to horde that terrain for a few turns in order to pull it all off. Clever, clever, clever. The tokens that can be earned via exploring should not be underestimated. Not only do the animal ones allow a substitution for using a card when exploring, but there are three gems and three artifacts. The artifacts are all different, allowing you to instantly move to a new location, reposition cards, or even take an extra turn. The gems are worth 1 point at the end of the game…but only if you don’t use them. And you’ll be tempted to at some point, as they allow you to take 2 cards from any pile to your hand, even your opponents’ discard pile. Or they can be used to move the raven onto a mountain, essentially making it a valley while he is there. Once you get the main game down (one play is likely enough), there are two ways to expand your fun: events and enchantments. Events shuffle a few more cards in the deck and, when the event is drawn, it is revealed and executed. The player then draws a replacement card. The enchantments alter fundamental aspects of the game, such as setup and gameplay, but is known from the start by both players. Both of these modular items are fun inclusions that add a little variety and randomness that players will have to work around. There is a solo mode for the game in the box – I’ve played it only once so far but it is an enjoyable puzzle as you race against the Raven. Look for a review of the solo mode in either December or early 2019! If you have a tiny table, this game will NOT be your friend. For a small, compact box…this thing needs a ton of real estate! You need room to make a 3 x 6 surface for cards, that is wide enough for them all to get explored (tapped), and have space for rows of mountains and valleys between them (thankfully, these are small cards). Then do it again for the other player. Could you play this on a pair of airplane trays? Yes, but only through creative stacking of cards being played. Very creative stacking. I like the raven in theory. He does something really helpful in making an impassible path usable. Or he lets you draw extra cards. However, we almost never use him! If those gems weren’t worth points at the end of the game, he’d be used often. But rarely is he an essential part of the plan, usually only coming into play to pull off a big move late in the game that is going to earn more points than the player is losing by using that token. I am all for clever flavor text. In fact, I absolutely LOVE the flavor text in this game. However, there is nothing to evoke the fun of the text on those cards. No special art or meaning, just the text on the cards at the bottom. And do you know what that means? It often goes unread and unnoticed. I understand the reasoning for the cards having no special art. But I think it was a missed opportunity here to add immersion that complements that flavor text. Player elimination is never a good thing in a game. This has a similar vibe, in that if a player cannot make a play on their turn they have to reveal their hand and pass. This removes them from the game, and the other player can keep on going until the game ends by either depleting the draw deck, placing the 18th land card, or passing as well. Should there be a penalty for painting yourself into a corner? Sure. Watching your opponent potentially play for 5+ more rounds with no pressure on the game ending is not the ideal punishment. When I was at Gen Con this year, the Eagle-Gryphon booth was on my short list of stops that I had to make before I left, and it earned that for two reasons: I wanted to see Vital Lacerda’s Escape Plan and demo it if possible (I saw it, but they didn’t run demos) and to pick up Fantastiqa if it was there. The wonderful Mina’s Fresh Cardboard reviewed it so long ago and I fell in love with the game’s artwork, mechanics, theme, and literary inspirations. I hadn’t played it yet, but on the strength of her review I was ready to purchase that game with my very limited spending budget. Sadly, they did not have any copies of that game. Happily, they had this there and I picked it up instead. This game has served as my introduction to Alf Seegert as a designer, and it was a pleasant one. The game is simple at its heart, yet how everything flows together makes it as beautiful to experience as the art on the cards. Like Hanamikoji, the core of how to play is simple and it gets the weight, and depth, through the interactions and the strategy within the game. The star of the show, of course, is the clever way cards are discarded after spending them to explore – that in itself makes this game one I love to play because it makes you pay attention to what our opponent might need before you use a card. The last thing you want to see is them drawing turn after turn from that discard pile you’ve been fueling. Which then ties into the Adventuring portion of the game, being one of the two actions you can take on your turn. You can explore as many unexplored cards as you are able to on your turn, so long as you do not double back to the same card. But wait, there’s mountains blocking your path across some of the board. Oh, and those cards you use go to your opponent’s discard pile. But there’s also tokens you collect via exploring (some of which can be used in place of a card for exploring), and a lot of the scoring centers around explored cards. So suddenly those cards in your hand have two purposes: the number or the terrain type. And those are just a few of the layers of this onion you get to peel away, delightfully, as you play this game. Because there is rarely an easy, obvious decision to make. Every move can and should be considered carefully because it can have some lasting effects later in the game. Which leads me to one of my only concerns: a player prone to severe analysis paralysis might find this to make their brain explode in the same way it might while playing Hanamikoji. Those simple decisions are rarely able to reveal the perfect moves to make, and a person who needs to make THE optimal move every turn could stall out for long periods of time while trying to decipher what is that optimal move. But for gamers like us, who play for fun and who enjoy those challenging decisions but rarely let them force us into long delays of quiet contemplation, this game will definitely deliver a delightful blend of tactical and strategic decisions within clever, yet simple, gameplay. I am always eager to play this game again, to add in some new cards that will affect the gameplay, and ultimately to pick up the small expansion and see how it alters the overall experience in this tiny box of fun. Thank you for checking review #77 by Cardboard Clash. My aim is to focus on reviewing board games and how they play for two people and, on occasion, how they play for one person. Because my wife is my primary gaming partner, a lot of consideration goes into finding those games that play well with 2 players, and we typically prefer to find those games that do not require a variant (official or otherwise) in order to play it with just the two of us. Carthago: Merchants & Guilds is a board game designed by Ralph Bienert and Bernd Eisenstein that was published in 2018 by Capstone Games. The box states it plays 2-4 players in 60-90 minutes and has a BGG weight rating of 3.00. Carthage – about 800 years BC.Founded as a humble trading post by the Phoenicians, the city quickly grew into an important trade hub where precious goods from around the ancient world were traded. In Carthago, players represent merchants who attempt to increase their wealth and influence while improving their status within the Merchant’s Guild. Become the greatest merchant in Carthage by loading valuable wares, financing expeditions, and exerting influence in clever ways. An extraordinary card-driven game of tactics that demands making the right decisions at the right time! On the surface, very little changes regarding the gameplay on Carthago regardless of player count. The number of ships in the harbor decrease to 3 (# of players +1) and the board pieces clearly identify what ones are used in a 2-player game. The biggest change comes from the use of neutral pieces. They serve no function other than being obstacles, with discs covering the four corner seats on that board, and both unused color cylinders being placed on the action wheel. When you use an action where a neutral cylinder is located, you have to discard a card to the right side of your board (like you would if an opponent was present) and move that neutral cylinder clockwise one space at the end of your turn (it goes to the next unoccupied action space, so it may skip up to 2 spaces on the action wheel). That’s it, the rest of the game plays out like normal. A lot of what this game does right is how it handles the action wheel. For every other player’s cylinder on the space you go to, you have to pay an extra card from your hand to use the action. So some actions in a 2-player game will be “free”, requiring no additional discards, while others will likely cost you an extra card. With a starting hand of 7 cards, you can afford to pay extra twice before you need to start tapping into cards earned from the market or from ships. While the 2-player game loses the risk of a spot costing 2-3 extra cards, it makes it so most spaces will cost you something which makes planning ahead essential, as you can predict how those cylinders will move (to the next unoccupied action space going clockwise) and, if you read your opponent right, you can know when a space should open up for you to move in and take a cheaper action. This game requires efficiency here, something I really enjoy. I love multi-use cards. Honestly, it is one of my favorite things to see in a game, as it provides difficult decisions from turn to turn. Here they can be used for their action, for the good, or for the monetary value. The ideal would be to never use those cards for their action, as it is the least effective way to employ the card – however, it does gain the benefit of returning to your hand at the end of the act if you use it for the action (or as the added cost for an action if another player is there, too). The guild is an interesting mechanic in the game. There are two guild houses on the action wheel, and they move clockwise after being used. Here is where you go to either purchase a seat in the Senate, or to purchase an end-game scoring achievement. This is the primary way you’ll end up spending cards (most likely) from the market and ships – as their currency value. And the brilliance of this is that it ties in with both the multi-use cards (because you’re needing to decide if to spend them here as currency and how many to use) and the action wheel (is it worth spending an extra action card to go where the guild is now – if I wait, does that let my opponent get the spot I wanted?). The game is tight, granting you exactly 15 actions over the course of the game. You will never feel like you’ve accomplished everything you wanted in a round, yet at the same time you can usually see how much you were truly able to do by the end. This makes me want to play it again and explore how to be more effective and efficient the next time I play. I like a little set collection in a game, especially when it plays off that multi-use card aspect by forcing you to use the cards for the goods, and trade in 2-3 of them. Your reward? Removing a disc off your player board, which can gain you extra seats in the Guild at the end, boost your attack power, or just get you more discs in a faster method. Bonus seats are given for emptying a full row, too, adding extra layers of decisions and strategies on how to use those cards and when to take that action. Scoring in this game is far more interesting and clever than I initially realized. While the achievement tiles are fairly standard fare (more on those to come later), the real showstopper comes from the Guild seats. You see, points here come from the number of seats are covered by your discs, plus bonus seats uncovered from your player board, plus bonus seats gained from emptying columns on that player board, times the number of ships you have. What does that mean? You can go heavy into seats and pick up a couple of ships and score well. You can go heavy into ships and pick up a seat or two and clear some of your board and do well. One strategy does not rule them all, which adds to the replay value, and excitement during the game, of Carthago. In spite of what I’ll be stating next, I really do like the use of the ships in this game. There are two harbors, one where you deliver a good of the matching type to the ship and one where you flip a random ship and compare attack values. You need to spend actions to place discs on each of these areas (meaning you’ll spend a minimum of 2 actions setting up) and then use an action to trade, which allows you to activate both areas (or just one, should you have a disc in only one of the harbors). Even better is when you deliver goods at the main harbor, that ship goes to your supply and all ships behind your harbor space move forward one space. Which allows a clever player to plan around their opponent…or for the mean player to use that action one turn faster to move that ship out of the harbor space your opponent is sitting on. Let’s not pretend that the randomness element doesn’t exist in here – probably just a bit more impactful than I’d like in a game like this. It comes into play in three primary ways: the market, the attack ship, and the rewards from a ship. Usually you’re looking at the market to try and collect the required sets to unlock spaces on your board and get more discs. That can get frustrating when you have 2/3 of a card type and the third one never appears in the market. The attacking of the ship is a blind flip of a card value 1-6…your base attack is 1 and it caps at 5 without a ship’s special ability to add +2 meaning there’s always a chance of victory or defeat in what could ultimately be a wasted space which required an action to place the disc to use in the first place. Finally, there are few things worse than winning a ship and getting rewarded and you gain a single card, while your opponent flips 2 small cards and then one big one when they fill a ship’s order on the next turn. Because you flip cards off the deck until you equal or exceed the value printed on the ship, this can happen far more often than you’d expect. The ships you gain not only earn you cards that are worth actions/currency/goods, they also go to your personal supply and provide you with a usable action that can be used on your turn in addition to moving on the wheel. These range from wiping the market to moving ships in the harbor to being able to purchase achievement spots from a previous age. I love this in concept, but so far I rarely see use from any player out of these extra actions because they rarely become necessary. However, the other nice thing is the market action lets you flip a ship back to its ready side, meaning they don’t have to be 1-time use abilities. The end-game scoring achievement tiles are the biggest detriment in this game. Not only are there not enough of them to add variety (2 of the 3 for each age are used in a game), but they feel undercosted. The first person to mark one only has to pay 2, the second person 5. Cards range in value from 2-6, so the first player to mark one has to pay only one card guaranteed. Considering the price of a Senate seat in comparison, and how many points these scoring achievements can be worth, and how easy it can be to get at least 6 points from most of them, they just feel like the obvious choice for using your coins/guild action. Carthago is a game that Clay from Capstone rightly put onto my radar as one I would probably enjoy and would play well with two players, and this was definitely the best purchase I made at Gen Con this year. While my wife wishes we didn’t need to use neutral pieces in the game, it isn’t like they do anything other than add cost to actions and therefore makes your decisions a little harder and the order of taking actions more important. I feel it would definitely lose out on something if the neutral items were removed, making it a far more open game that requires less planning and provides more abundance for cards and resources. The tightness is part of what makes this game enjoyable, as scores typically have ranged from 30-50 as an overall range across our plays. After just a handful of plays, this game shot up among the contenders for my favorite game released in 2018. Two more plays last week only solidified that placement, as this is a tight game about efficiency in action selection, resource/hand management, and planning ahead. That in itself would be enough, but it is also a game with sharp elbows as your opponent can easily foil your plans in a multitude of ways. You never openly play things in opposition to your opponent, but the game is small and tight enough that you’re always going to get in each other’s way – something I delight in even if I am not always happy about it in the heat of the moment. I’ve mentioned before that I enjoy the effective deployment of multi-use cards, and this one does a nice job with that as every card (apart from your starting hand) can be used in three different ways. Most of the time you’ll use the starting hand as the five actions in an era, but sometimes you want or need more of a specific action. Or you had to discard too many cards with your movement, and so I like that the market cards all have actions on there, too. The ships are a great aspect of the game, and having two ways to get them is great. Maybe I’m just underutilizing them, but the actions on the ships are mostly just okay during the gameplay. I’ve seen cases for each of them being useful, but I’m as likely to not use the ship’s ability over the course of the game. Yet this is not a perfect game, even though it is delightful and hits all of the right notes along the way. Ultimately, replay value in here is what comes into question as there is not a lot of change. Sure, you’ll have different ships at different times and a different market, making certain resources more scarce than others and affecting how much currency is “available” at a time. What I’m talking about is the scoring goals on the act tiles. In the box there are 3 tiles per act, and you use 2 of them per game. That means ⅔ of those tiles are used every game and even if the next game uses the unused tile, you’ll still have a repeated scoring condition. This doesn’t detract from the game experience, but certainly could limit its freshness upon future plays. Overall I really like Carthago. It would certainly be somewhere in my Top 25 Games if I remade that list today, and this game is priced really well at a $40 MSRP. This game has the meaty decisions that I love as a heavy gamer, combined with a simple ruleset that can be taught to almost any gamer in a short span of time. Between the value of this game, the excellent gameplay, and the moderate rules overhead in the box – this becomes the sort of game I don’t hesitate to recommend to almost any sort of gaming group. And because the game scales quite well, it would be a solid experience whether you have 2, 3, or 4 players.